Born Hamilton, Ontario, 27 July 1874, son of Frederick and Mary I. Bennett. Educated at Hamilton, Ontario. Commenced career as junior clerk in Traders Bank, Hamilton, 1890. Came to Winnipeg, 1909. Served three years in 13th Battalion, Hamilton, Ontario. Married Nettie May Johnson, St. Catharines, Ontario, 1899. He was a member of the Manitoba Club and Carleton Club. Recreation: travelling. Anglican. Address: Winnipeg. 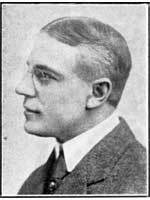 In 1911, Atkinson was the Manager of the Traders Bank of Canada, in Winnipeg.